Sam Adams, writing in the online website This Is Local London, reported the lighting of Chanukah Candles last night using what is thought to be the world's first ever whisky menorah. Dozens of people turned out at Buckhurst Hill Chabad, in Princes Road, to see the seven-foot-high ceremonial candle holder - made of clear pipes - filled with 65 litres of 17-year-old Scottish single malt in celebration of Chanukah. Whisky from the menorah was then poured from a tap in the structure's stem and auctioned off in bottles by Rabbi Odom Brandman to raise money for a new centre for the area's Jewish community. 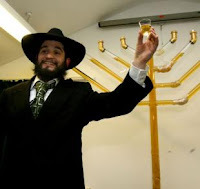 Rabbi Brandman - who had earlier led the lighting of a publicly displayed menorah in nearby Queen's Road - thanked the Tullibardine distillery for donating the whisky. He said: "We like to celebrate Chanukah a little differently, and had a menorah made of old cans last year, and out of chocolate the year before. This year we decided to go for the world's first whisky menorah. 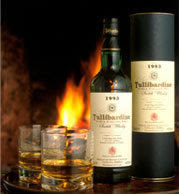 "We knew we needed a lot of whisky, so we contacted Tullibardine, who very kindly offered to donate 65 litres for our menorah. The whisky itself is really nice. It's smooth, mellow and has a slightly fruity flavour. I have been on a tour of the distillery and the management there have been so helpful, accommodating and as excited as us about making this Menorah really special."